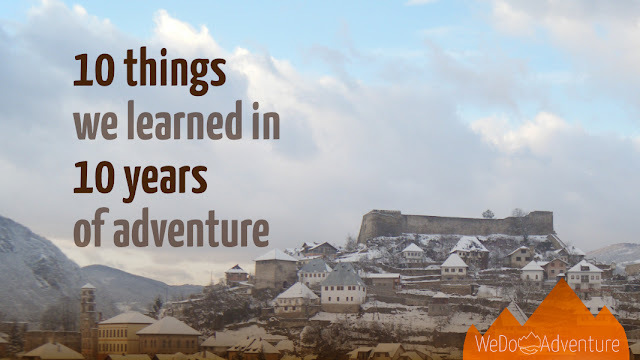 While the town we came from in the UK is in the grips of some unseasonally large snow falls, Jajce has not yet plunged into the depths of winter. No doubt it will come. Today we had enough sunshine to add a rainbow to a now familiar view. Yes, a rainbow needs a little rain and we've had a bit but nothing like what's going on back in Mostar at the moment. Rowan was looking at some pictures on Facebook earlier and said she never saw the Neretva so high in the two years we were there. Apparently the border at Metković was closed due to flooding in the town. With so many of Bosnia and Herzegovina's main roads running alongside rivers I've often thought how vulnerable this network is to rising water levels. Snow, however, it is well equipped to handle, at least in our experience. Gritters and snow ploughs operate around the clock keeping the main routes passable, if not entirely clear. The requirements to put winter tyres on every November and carry snow chains help too, although people only seem to resort to chains if absolutely necessary. Like the time one of my back wheels froze on the top of a mountain. Snow chains gave enough traction to drag it down to below the snow line where the bare tarmac provided enough resistance to work it free again. And so to all my UK readers struggling with the country's less-than-entirely resilient infrastructure, enjoy the snow-break...and if you see a set of snow chains they are a worthwhile investment!